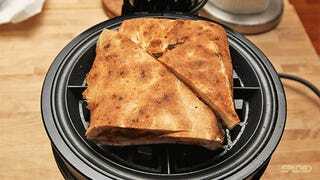 I nominate Serious Eats' J. Kenji López-Alt for fast food genius of the year for this clever hack: turn a leftover pizza slice into a delicious snack using a waffle iron. Oh gods of the junkgourmandize, simplicity can be truly beautiful and succulent indeed! Just add toppings, fold into a triangle, trim the excess, and put into the waffle iron until it's done. Of course, this can be as tasty as your imagination allows. Here's a quick recipe I'd like to try: add some extra strong cheese (like an idiazabal or manchego curado), some chorizo or finely sliced bacon with a pinch of Spanish Pimentón de la Vera, a few drops of extra virgin olive oil, some freshly sliced tomate and some black pepper.